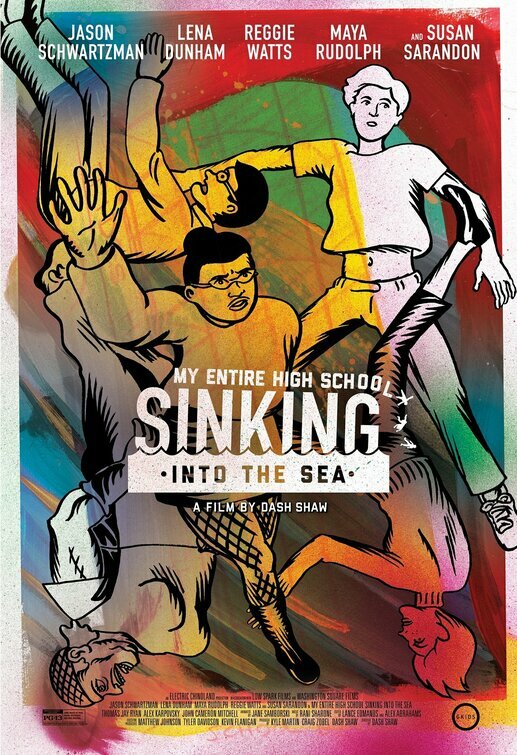 While I have never subscribed to the notion that the narrative of a film is always more important than its visuals, My Entire High School Sinking Into The Sea lacks in depth both narratively and visually. But when I say it lacks in depth visually, I thoroughly mean it as a compliment- everything is very flat and two-dimensional because it’s meant to look like a graphic novel, which is what writer/director Dash Shaw is best known for. The animation style is colorful and trippy- it’s also choppy and unpolished but that is what works in its favor. As this film is centered on a group of teenagers and is narrated by its 16-year-old main character, it makes sense that it looks like something sketched by a teen. The concept of a sudden epic disaster being inflicted upon a high school in which the heroes are mostly social outcasts literally sounds like something a 16-year-old would daydream about in class as he draws the popular kids drowning in the margins of his notebook paper. There is literally a scene in which one of the popular girls begs to be rescued by the nerdy main characters by offering to invite them to her next party, before slipping into shark-infested waters. For misanthropic teens, this is unapologetic wish fulfillment. But Dash Shaw seems to be aware of this because he named the pretentious main character after himself. Dash (Jason Schwartzman) is a kid who exists in real life and you probably hung out with him in high school. Everything is pointless, the nerds and the artists are the only people who really understand the world, don’t be a sheep, etc. Not following the crowd and staying true to yourself isn’t a lesson without merit but Dash is mean and petty. And this is pointed out to him early on in the film- that he thinks people don’t like him because of his acne but it’s really because of his personality. He does eventually learn his lesson but the moral is still lacking because it is so clearly written to be flattering and easily palatable to 15-year-old nerds. Not only is he the only one with the bright idea to not stay on the bottom floor when the building is literally sinking, but he was the only one who knew the disaster was coming. Of course he warned them and nobody listened until it was too late. The very simple messages of this story aren’t particularly new – ‘remember who your true friends are’, ‘don’t sacrifice your individuality to fit in’, ‘high school doesn’t matter in the grand scheme when you’re literally faced with a life-or-death situation’ etc. But there’s also something in here that is very specific to millennials. There is a throwaway line or two about the recession and the increasingly narrow job market, which is interesting within the context of an apocalyptic disaster- that young people are under constant pressure by adults to be successful but are simultaneously trying to survive in a drastically changing world that those same adults are responsible for (ex. Baby Boomers voted for Trump and tanked the economy). In this case, it was the adult with the most authority (the principal), who knew but chose to ignore the fact that the building was at risk of collapsing. This movie could apply to the young-adult anxiety felt by any generation, but feels particularly apt in representing the current one. But I might just be reading too much into a film that will inevitably gain a cult following of young stoners.